Many people still love a good ringtone, in spite of their waning popularity in the United States. Abroad, people of all ages are buying ringtones increasingly, in spite of industry projections that the entire market will collapse in the next twenty years. Lil Wayne holds the prestigious rank of most popular ringtone ever (for his song "Lollipop"), but most people opt not to buy pre-made ringtones anymore. With the ability to turn any eclectic tune into an artistic expression of personality, ringtone users are making their own sounds more frequently than ever. 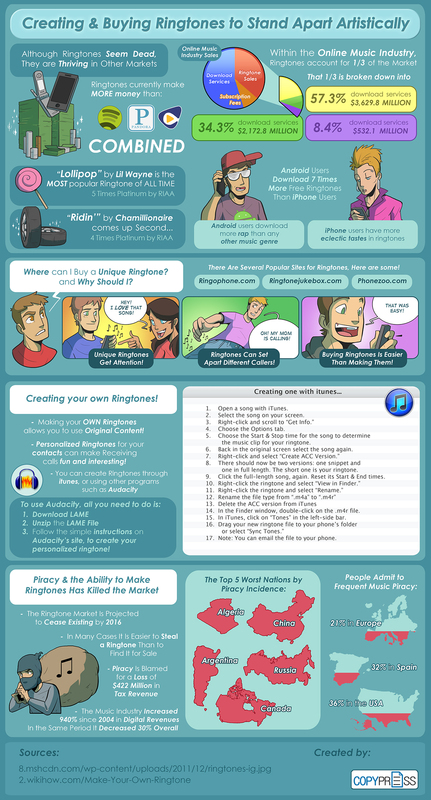 Read this useful infographic to learn about the ringtone industry, and how to make your own unique ring. The newest cell phones deserve the freshest mixes for ringtones: with just a few minutes' work, you too can craft a one-of-a-kind soundbite for personalized ringing.